1) Captured older people’s views and experiences of collecting and using health data. 2) Strived to understand if and how people collect data to look after their own health. For example measuring blood pressure, blood sugar or keeping a food diary. 3) Built a community network of people and organisations with an interest in health data research. Community Reporting is a method that enables people to share their personal stories and lived experiences through video recordings. The Community Reporters model supports people with learning to tell their own stories, collect stories from others, edit content and upload it to the Community Reporters website. Eighteen community reporters and twelve exercise class participants from Salford and Wythenshawe. All community reports that people made as part of the project can be found here. We also made compilations of the best community reports that summarise older people’s views on health data. There is one on data from activity trackers and one on other types of data. Below are some quotes from the compilations. "I would have gotten more out of the tracker if I would have had one-to-one support with setting it up." "The tracker motivated me to walk that extra bit." "I think activity trackers are a good idea, but I couldn’t afford to buy one." "I found out that I have a lot of deep sleep." "I have mobility problems, so I didn’t make my targets." "I didn’t use the app because I’m not very technically minded and I don’t have wifi at home." "The Healthy Eating app helped me think twice when reaching for that extra biscuit." "If we would have started taking my mum’s blood sugar at home sooner, she might not have been on insulin now." "When I measure my blood pressure at home, it’s much lower than at the GPs." The results of the project were presented at The MICRA seminar and at The Informatics for Health conference (Manchester, 24-26 April): abstract no 436. 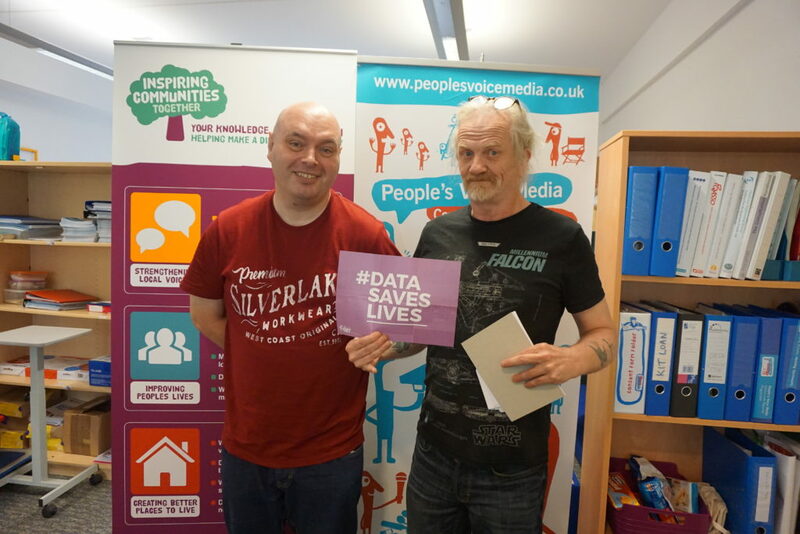 Salford Inspiring Communities Together are preparing a follow-up project with activity trackers, where exercise class participants will learn more on how to collect and use their own health data at home. The AgeUK Crossacres Resource Centre in Wythenshawe will continue making community reports to promote their activities. Both organisations are keen to be involved in future initiatives with the Health e-Research Centre. The first week of the Community Reporters scheme took place in Salford this week. A group of local participants were tasked with taking creative photographs based on the topic of general health and their personal experiences of the healthcare system. Jennifer took a picture of the NHS Community Centre sign through a fence, explaining that poor health can act as a barrier. Geoff took a picture of a ‘no smoking’ sign, an aspect of health to aspire to. The conversation that led on from discussing the inspiration behind the photographic compositions allowed the group to cover issues that were important in their personal health experiences. This included how vital friendship and support networks were during health management, how interaction and social settings enabled people to feel like progress was being made and how accessing the wealth of information available can help to feel an improvement. Today, three of Salford’s already trained Community Reporters came together for their monthly Community Reporter meet-up. The focus of their meeting was to learn how to produce a report using audio. Supported by video trainer Matt, Dave, Iain and Stephen listened to a series of podcasts. They discussed what they liked and didn’t like about them, and what techniques they could take from them when making an audio recording themselves. Their assignment for the next meeting is to develop a script for an audio community report on health data. Dave plans to interview his sister about the blood tests she does herself, Iain will try out several health apps, and Stephen wants to share his experiences of using a heart rate monitor at home. Looking forward to hearing people’s opinions. An impressive number of people attended this week’s Community Reporter training. Held at Old Lane Community Resource Centre in Little Hulton, 11 participants were present. And as you can imagine, there was a lot of talk about health data. Especially when the activity trackers were presented. Ten of the participants wanted to test one out for a week or two. Some were most interested in counting their steps, hoping it would motivate them to walk about more and achieve their ambitious targets. Others will be monitoring their sleep to find out how much of the night they are in deep sleep. Sara decided she didn’t want to try the activity tracker. She was concerned that it would make her even more anxious about her health than she already was. All of them will be back next week to film reports on what they think of the trackers, and to share their views on if and how the health data might help them to stay healthy and well. Today we handed out activity trackers to older people attending a ‘Step Up’ exercise class. These classes are designed to improve and maintain strength, balance and flexibility – a well-recognised technique to reduce risk of falls and optimise mobility. We handed out the trackers to eight volunteers, they are all set up and ready to go. As a group we had a lively chat about engagement with technology. Those with younger family members knew about different types of technology available, but felt disassociated from a tech-savvy culture. Nobody in the group had used activity trackers before, but all expressed an interest in seeing the kind of health data they could collect. Next week, community reporters from the Salford training group will interview volunteers about their experience with the trackers. It will be interesting to see how they progress. Seven participants started their community reporter training led by Hannah from Macc. After a discussion about what ‘heath data’ was, we wrote a list of questions to ask older people in a journalistic ‘interview’ style. The participants then split into pairs and set off to film their interviews with fellow residents at AgeUK Crossacres Community centre. Kath interviewed Martine about how she uses her blood glucose monitor to self-manage her diabetes. Camera duties were switched and Martine interviewed Kath about her experiences using a home blood pressure monitor, keeping a diary of her readings to share with her GP. This proved very helpful to Kath as she was reassured to see it was actually much lower than during her GP visit. Rebecca and Malc interviewed two people visiting AgeUK Crossacres about their health. Neither used any monitors at home, but had suffered various health problems. This prompted a conversation about how they would value any form of health data collection if it benefited their health. Eileen interviewed a group of women visiting the AgeUK Crossacres café. At first, none thought they had really used ‘heath data’. With some explanation, two revealed they had used a home blood pressure monitor, and two regularly filled in well-woman surveys for their GP. After defining the reality of what could be used to record personal readings, it was far more accessible for them to understand. Kim and Morag interviewed a man who used an activity tracker every day to monitor his cycling commute. He thought that being able to see his own health data encouraged him to cycle faster. 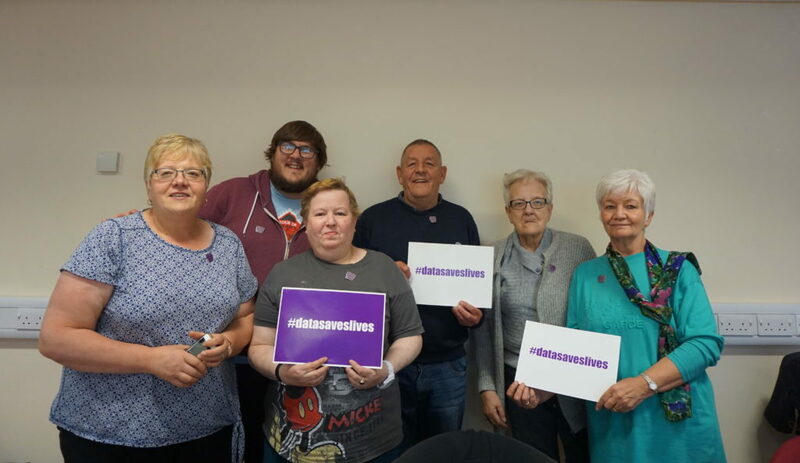 Afterwards, we had a discussion about the term ‘health data’ and how it is often difficult to get across what this means, especially to an older generation perhaps unfamiliar with this type of language. We were all touched by the personal stories told by interviewees in the videos, particularly the difficulties they have had with their health, and the positive impact visiting AgeUK Crossacres has had for their overall wellbeing. We kicked off today’s session by discussing how everyone got on with the activity trackers. All participants had used them over the last week, and managed to look at their data. Eileen and Cath both mentioned how monitoring sleep patterns was really interesting to them, especially the amount of ‘light’ and ‘deep’ sleep the devices suggested they experienced. Morag liked being able to see if she had reached her daily target. All agreed it was important that targets were personalised and achievable. Cath mentioned how she found one of the motivational alerts a bit dispiriting, as she has been struggling with a bad back. All felt activity trackers could have a positive impact for older people, promoting physical activity as part of a healthy lifestyle. Kim mentioned it was very important people had good support as some people may struggle with the technology. Eileen also pointed out that sometimes motivational alerts can be conveyed wrongly, and that there is the risk of ‘lecturing people’. We also discussed the motivators and barriers to engaging in research involving these types of technologies. Morag highlighted the importance of explaining the rationale of the project to participants, and the benefits of the research. Kim mentioned a buddy system may help promote engagement. We then discussed the videos everyone had made over the last week. Kath made a video of her measuring her blood pressure at home, and Morag made a video of her walking in the park. Hannah guided the group through the editing software, and explained the basics of how to create a video storyboard. It will be great to see the results next week. Over the last week, all Community Reporter trainees at Crossacres went out to shoot the raw material for their video on health data. Today, during their last training session, they learnt how to edit. Inspired by Beatrix Potter’s Flopsy Mopsy, Malc had tested whether drinking a lettuce and orange juice smoothie in the evening would help him sleep better. The sleep data from his activity tracker told him it did not, probably because the smoothie woke him up at 3am for a visit to the loo. 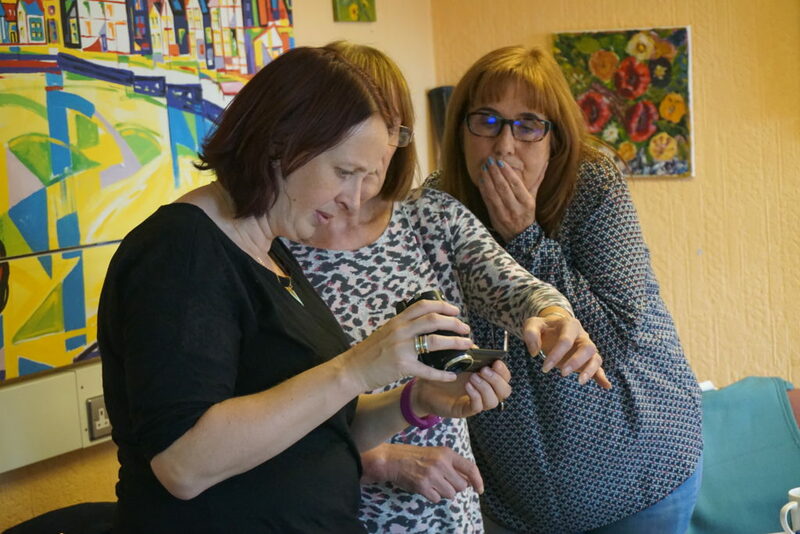 Kath shot images of herself measuring her blood pressure at home and Eileen interviewed people in the Community Centre about their thoughts on health data. The others shared their stories on how the activity trackers helped them monitor how much they had walked or swam. The editing proved challenging, and most reporters needed more time to finish their video, but they promised us it won’t be long before the first results will be uploaded onto the Community Reporter website. My name is Joanne and I am a geriatrician, which is a trainee hospital doctor specialising in care for older people. I started working with Sabine at the Health eResearch Centre (HeRC) last year, hoping to boost interest in technology-based public health research involving older citizens. Since then, we have worked on a number of projects, trying to learn more about how health data research can improve health and wellbeing in later life. I provide my experiences as a doctor, and Sabine contributes her skills and knowledge as a researcher. 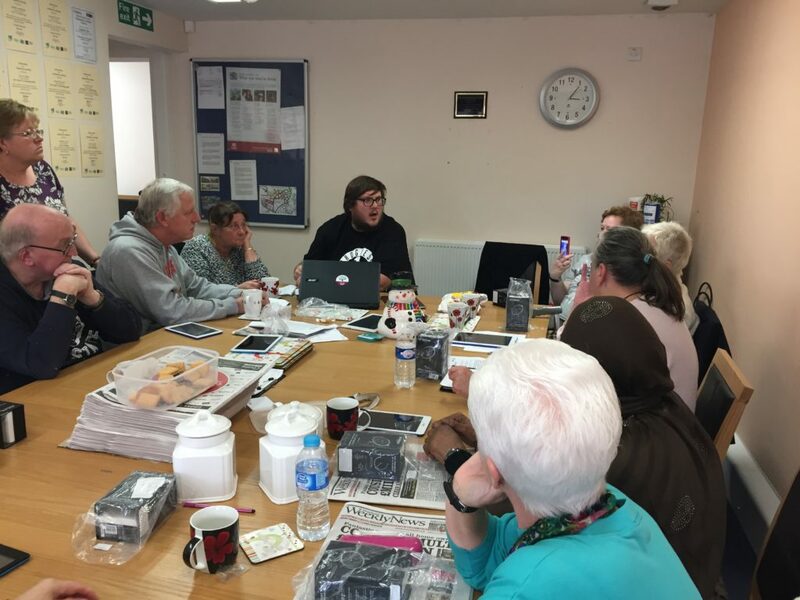 We then got chatting to community groups such as Inspiring Communities in Salford and AgeUK Manchester at Crossacres, and before you know it – we had a public engagement project! 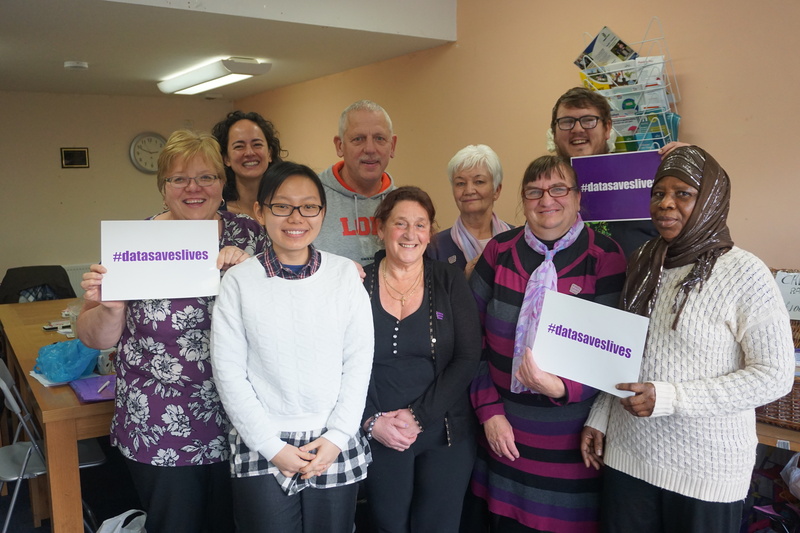 The #datasaveslives Community Reporter scheme has been the first public engagement project I’ve been involved in. We are now roughly half way through, and I am happy to report it is all going very well. ‘Health data’ can seem like an abstract concept, even to a clinician. 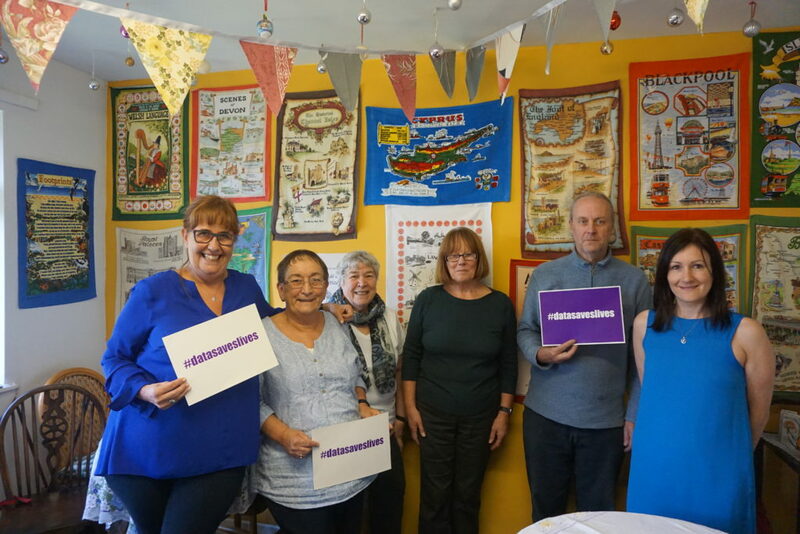 However, during our first group session at Crossacres on 19th October, all the volunteers quickly picked up on our theme, and shared some really insightful personal stories. 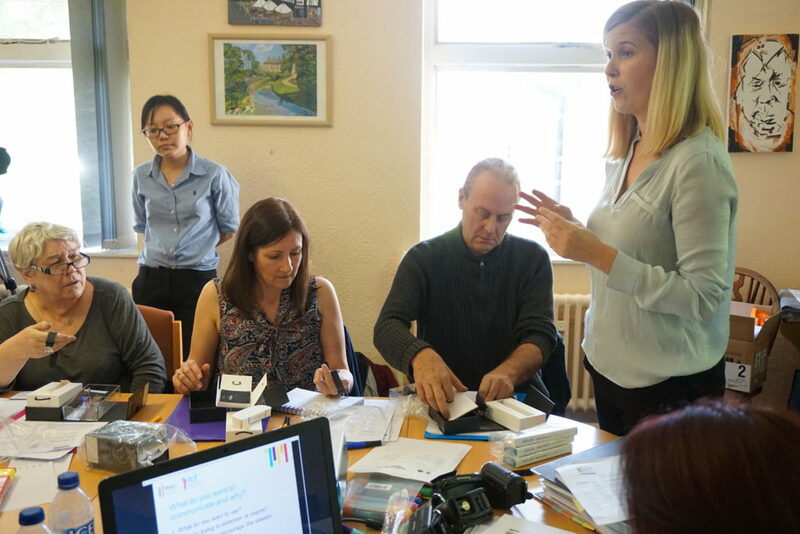 The volunteers were then sent out into the community centre to record video interviews with members of the public, using the topic of health data. The results brought us all out in uncontrollable giggles! But there was also some amazingly high quality video content to view. The second session was a bit of a crash course in video editing. Our trainer – Hannah from Macc – patiently guided everyone through the software and demonstrated how to create a polished final film. 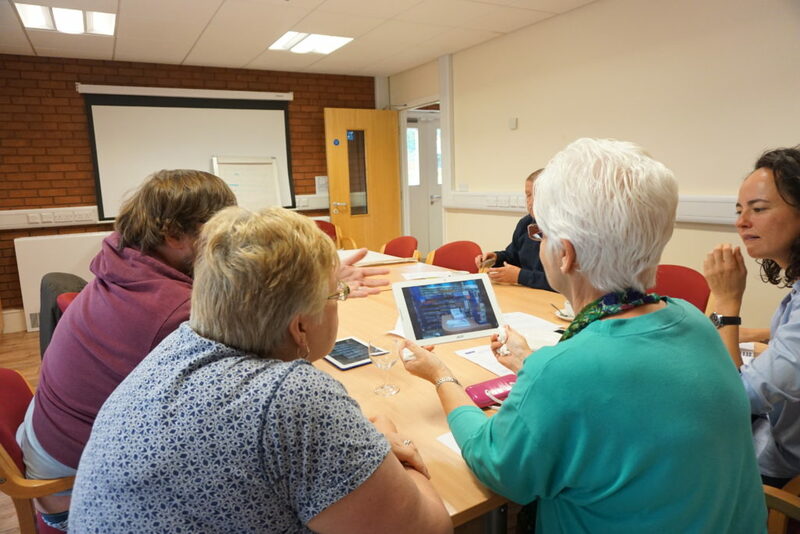 The training is now complete, and the newly qualified Community Reporters at Crossacres will be interviewing local members of the senior exercise class next week as their first assignment. Based on today’s progress, I can’t wait to see what they come back with. Today we handed out activity trackers to three volunteers from the local ‘Active for over 50s’ exercise class, as arranged by Eileen. Kim filmed the session, now looking like a true professional behind the camera. I explained the project, and then Eileen, Kim and Kath showed each volunteer how to use the watches. Soon I will be out of a job! It was great to see them taking control. The exercise class volunteers will come back next week to be interviewed by our new Crossacres Community Reporters. Our three volunteers from the ‘Active for over 50s’ exercise class returned to Crossacres to be interviewed by the Community Reporters. Kim did the filming, whilst Eileen and Kath led the group discussion. All of them agreed that activity trackers could be useful to monitor health, especially for people with chronic conditions such as diabetes or heart problems. There was a lively discussion about the perceived accuracy of the devices especially surrounding sleep, which seemed to be a recurring theme! We had a chat about how activity trackers may alter behaviour, and the pros and cons of seeing your own health data. And that was the final session at Crossacres! Just want to say a big thank you to all of our volunteers – it has been a fantastic experience working with everyone, and I can’t wait for our ‘film night’ once all the videos have been edited.